Jupiter, Mars and Saturn were all sitting together in the night sky!" This Noble Order of Tara Initiation structure was developed by Olivia Robertson in the year 2000, which she introduced in Isian News #97. You can read her announcement of it here: Lughnasad 2000 and read the beginning formative ideas from her letters on this page: initiation structure letters. Within this framework, there are 12 Initiations divided into 4 Grades. The Priory Grand Dame/Knight Commander offers a program of study around the NOT Initiation dramas. These may be taught either in person or through correspondence. Each program of study is completely original based upon the Dedicatory Deities of the Priory and the FOI Liturgy. 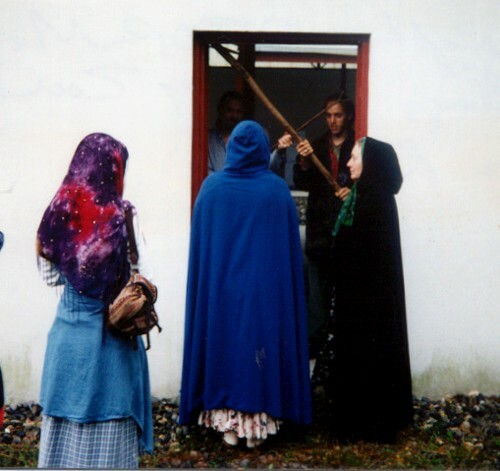 The entry ritual to the NOT is the "Rite of Tara, Initiation into a NOT Priory". (PDF Version / HTML Version) This is separate from the NOT Liturgy initiations below and enacted when the candidate is spiritually ready to become a Companion in a specific Priory of the NOT. The Noble Order of Tara promotes dedicated work for our planet. The 12 Initiations are divided into four Grades. Three Initiations are experienced within each Grade. The first Grade brings spiritual strength to those who work for their local environment. Success brings the designation of "Dame or Knight". The following rituals within the booklet Melusina are used to attain initiations for this Grade: 1) Initiation of the Pylons, 2) The Awakening of the Golden Phoenix, 3) The Descent of the White Eagle. The 2nd Grade develops spiritual awareness and the ability to commune with Nature Spirits. The designation "Lord or Lady of the Grael" is conferred. The following rituals within the booklet Melusina are used to attain initiations for this Grade: 4) Arousing the Kundalini Serpent, 5) Creation of Life Forms, 6) Dawn of the Inner Sun. The 3rd Grade honours skills in working with other groups and cultures, with our common purpose of saving the Earth. The appointment for this Grade is "Dame or Knight Commander." The following rituals within the booklet Melusina are used to attain initiations for this Grade: 7) Opening the Heart's Rose, 8) Unfolding Wings, 9) Music of the Spheres. The final Grade, confers the right to found a Priory as a "Grand Dame or Knight Commander" because of all-around abilities. The following rituals within the booklet Melusina are used to attain initiations for this Grade: 10) Opening the Eye of Vision, 11) Crowned with Glory, 12) Lighting the Rainbow Aura. When a member achieves any of the four Grades in the NOT, it is then registered with the Fellowship of Isis. There are 12 working initiations in the NOT. The rites 1-12 of the booklet Melusina, Life Centres of the Goddess, make up the Liturgy of the NOT and are noted on the planetary rays of the Cosmic Web diagram. Grand Dame/Knight Commanders create their own courses, linking with these rites from the above NOT Liturgy. The Dramas of Initiation are based upon the intersecting points made by the Star of Ishtar bisecting the 4-fold coils of the Dragon Tiamat. Please see the Cosmic Web of the Universe for more information. Additional Note: This is the only system of study that was solely written by Olivia Robertson at Clonegal Castle for the Noble Order of Tara. It was her unique vision and gift to the NOT as well as the DCD, as initiation systems for both were inspired at the same time. Although Olivia encouraged other members to create their own systems if they wished, the Initiation and Grades included in these pages were what she created for the overall Fellowship of Isis and at her request, were always included in the yearly updated FOI manuals as well.